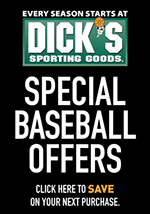 Sunday Showcase Clinic at Extra Innings from 2:00 p.m. to 3:30 p.m. The Plainfield Pee Wee Baseball Association will be holding another 7U and 8U Sunday Showcase clinic on Sunday, November 12 from 2:00 p.m. to 3:30 p.m. at the Extra Innings Indy West on 9225 West 10th Street in Indianapolis. All upcoming 7U and 8U players who are interested in the Sunday Showcase program can take part in the indoor clinic for extra baseball instruction and to get ready for the 2018 season.